At the end of December 1772, an Anglican priest in the poor parish of Olney worked by candlelight on his New Year’s Day sermon. He would preach on the text of 1 Chronicles 17:16-17. That pastor was John Newton (1725-1807), and those words struck a deep chord in his heart. In those last days of 1772, Newton found himself running out of empty pages in his journal, a bound book of 300 pages holding 16 years worth of entries. As he came to finish that journal and start another, his mind was drawn to the pages of his past– the story of his life from his days as an unregenerate slave-trader to becoming a child of God. As was his habit, Newton set to work composing a hymn to illustrate his New Year’s Day sermon. In that hymn, he would tell his poor congregation of lace-makers and low-paid artisans about the dangers and snares he had faced. He would reflect on the amazing grace that had saved a wretch like him. Those now-famous words of Amazing Grace, first sung in the small parish of Olney on New Year’s Day, 1773, lingered in obscurity for many years. Even as Newton counseled the young William Wilberforce and encouraged him to stay the course in the long battle against the slave trade, the words to Amazing Grace were little sung in England. But the Olney Hymnal, later published by Newton, caught on in the Americas. The words of Amazing Grace would surface again some 80 years later in a book that would change the course of this nation, Uncle Tom’s Cabin. In it, the slave Tom, at his lowest point, sings the words of Amazing Grace. Two verses hardly sung today were sung by Tom: “And when this mortal life shall fail/ And flesh and sense shall cease,/ I shall possess within the veil,/ A life of joy and peace.” These words of the ultimate hope in God, even in the face of deep injustice, forever entwined the words of Amazing Grace with the plight of the slaves. But it all began in that dark little study in the waning days of a year gone by, when one man took the time to reflect on God’s goodness to him. This New Year’s Day we’d all do well to pay tribute to Newton by imitating his gratitude to God and his heart for the lost. We would do well also to set aside some time to reflect on what God has done in our lives– how He has delivered us from slavery to sin. And we would do well to consider how we, in this new year, can sing God’s praise with our lips and with our lives. Although my memory is fading, I remember two things very clearly: that I am a great sinner, and that Christ is a great Savior. I Chronicles 17:16 — Then King David went in and sat before the Lord, and he said: “Who am I, Lord God, and what is my family, that you have brought me this far? I Corinthians 15:10a — By the grace of God I am what I am, and his grace to me was not without effect. Ephesians 2:8-9 — For it is by grace you have been saved,through faith– and this is not from yourselves, it is the gift of God– not by works, so that no one can boast. Titus 2:11 — For the grace of God has appeared that offers salvation to all people. In Mark 8:34 are these words of Jesus: “If anyone would come after me he must deny himself, take up his cross, and follow me.” Jesus tells us to all to ‘take up our cross’ if we want to follow him, and those words have led to an expression Christians often use when speaking of their troubles. It is ‘my cross to bear’ many will say when speaking of their bad back or frequent headaches or financial losses or difficult loved ones or whatever. It is a good line. It dignifies our suffering, and there is some comfort in that. We may suffer because we are following Christ, or we may suffer simply because that is how it goes in this fallen world. Either way, suffering can bring us closer to God. Hebrews 5:8-9 said even of Jesus, “Son though he was, he learned obedience from what he suffered and, once made perfect, he became the source of eternal salvation for all who obey him.” Even Jesus had to suffer, and so he said, “Take up your cross and follow me.” One might ask themselves, “What kind of king or queen do I think I am that I should not have to suffer? Everyone suffers, so who am I to ask, ‘Why me, Why me?’” Why not me? After all, unimaginable suffering came even to the Son of God, Savior of the world, so why not to me? Elizabeth Clephane was one who had more than her share of crosses to bear. Her father died when she was only nine, and her mother died three years later. Elizabeth herself was always frail and in poor health, and she died when she was only 39. But she bore her many crosses with dignity, and used what energy she had to follow Jesus. She and her sister used their time and their wealth to serve the poor, the sick, and those otherwise in need. In time, they had given away everything they had, living little better than the poor they were serving. The people of the town of Melrose in Scotland loved Elizabeth and her sister, remembering their cheerful disposition in spite of all they suffered. Not only did Elizabeth take up her cross and follow Jesus, she also wrote a song about it. She wrote many poems, and several were put to music after her death. But only one of them became a favorite, the hymn “Beneath the Cross of Jesus.” Every verse speaks of the cross of Jesus; taking a stand beneath it, looking to it, abiding in it, and resting in it. Knowing how she literally wore herself out in serving Jesus make some of the lines even more meaningful. The cross, she wrote, is ‘a mighty rock within a weary land, a home along the way, a place to rest from the burdens of the day,’ and so forth. Elizabeth knew her Bible well. These three brief verses contain images and phrases from Jeremiah, Matthew, the Psalms, and three from Isaiah. It is a wonderful hymn, filled with faith in and devotion to the one who died on that cross. Hebrews 5:8-9 — Son though he was, he learned obedience from what he suffered and, once made perfect, he became the source of eternal salvation for all who obey him. Psalm 62:7 — My salvation and my honor depend on God; he is my mighty rock, my refuge. 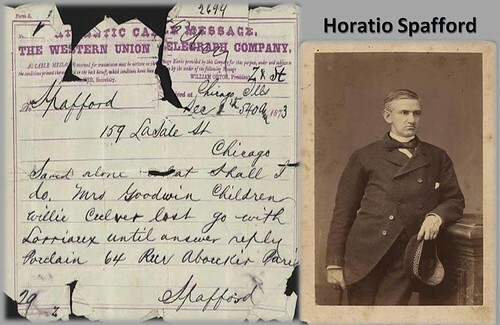 Horatio P. Spafford (1828-1888) was a wealthy Chicago attorney. He made a lot of money, invested it wisely in real estate, and was one of the wealthiest men in a city that was rising fast after the Civil War. Then, in 1871, the great Chicago fire consumed much of the city, and, most of Spafford’s great wealth. About that same time, his only son, age four, died of scarlet fever. Spafford dealt with his grief by pouring himself into his work, working feverishly at rebuilding the city and assisting the 100,000 people who had been left homeless. In 1873, after two years of hard work, Spafford needed a vacation. He decided to take his wife and four daughters on a trip to Europe. They had their reservations made on a luxurious French liner, but urgent business delayed Spafford in New York. He sent his wife and four daughters on ahead, promising he would join them soon. In the middle of the night, November 22, 1873, another ship crashed into the side of the French liner, and within two hours the liner had sunk into the icy North Atlantic. 226 passengers were drowned. Only 47 survived. Mrs. Spafford was found, nearly unconcious, clinging to a piece of debris. All four daughters perished (ages 11, 9, 5, and 2). Mrs. Spafford cabled her husband a message (see below) which began: “Saved alone. What shall I do?…” To lose one child is a stab in the heart– imagine what it must have been like to lose one, and not long after, the other four, all at once. Horatio Spafford left New York as soon as possible to rejoin his wife. One night while enroute, the captain called him aside and said, “We are now passing over the spot where the ship went down.” Spafford could not sleep that night, but sat up thinking and praying and writing. He wrote over and over again, perhaps trying to convince himself, he wrote, “It is well, it is well, it is well with my soul.” He kept working with that thought, and then later added the words that became a much loved humn. Out of such tragedy and sadness, Horatio Spafford was able to write this incredible hymn of peace and comfort and hope. “When peace like a river attendeth my way, and sorrow like sea billows roll, Whatever my lot, thou hast taught me to say, It is well, it is well, with my soul.” On the outside, everything was not well, everything was sad and lonely. But still, says the hymn, “It is well with my soul. The great melody that goes so very well with these words was composed by Phillip Bliss, a writer of many familiar melodies. Not long after he wrote this tune, he and his wife were killed in a train wreck in Ohio. The story behind this hymn is filled with tragedy, but that only serves to reinforce the message. All can go terribly wrong, but still, all can be well with one’s soul, that soul that remains in God’s good hands forever. 1 Peter 5:7 — Cast all your cares on God, for he cares about you. 3 John 1:2 — Dear friend, I pray that you may enjoy good health and that all may go well with you, even as your soul is getting along well. Oh, trump(et) of the angel! Oh, voice of the Lord! Lowell Mason lived in the early years of this country’s history. He was born during the presidency of George Washington. Mason’s passion was church music. He loved to direct church choirs, he loved to teach Christian music to young people, and he loved to write music. The only problem was he did not much time for any of that. Mason was not yet making any money with his music, so he had to work at another job. Fifty hours of the week he had to be at his job working at a bank. He labored at both his job and his dream for 16 years. Then he decided it was time to try making a living at his dream. He quit the bank, moved to Boston, and started writing music full time. He would try and make a go of it by publishing hymnals of old and new hymns. He could come up with music that people would buy, but he needed to find words; he needed to find people who could write good lyrics to go with his good tunes. Thus, he was always scouting around, looking for verses he could put to music. Mason liked the poem and took it home. That very night worked up a tune to go with it. The next time he saw Palmer, Mason said to him, “Ray, you might live a good many years, and go on to do many great things, but I think you will be remembered most for writing this hymn.” The hymn, “My Faith Looks Up to Thee,” went into Mason’s newly published hymnal– and it has been in practically every hymnal ever since. It has been called the first great American hymn. Ray Palmer did go on to do many other great things– as a pastor, writer, and translator of more hymns, and, he became an expert in Christian worship and music, quoted yet today in scholarly writings. But the greatest accomplishment of his life was written when he was a down and out, lonely and depressed 21 year old student. Palmer said, “The words for these stanzas were born out of my own soul with very little effort but with much tender emotion.” They were written not originally for a hymnal, but as his own private prayer. And all four verses do indeed make up a powerful prayer that can be said or sung anytime. Revelation 21:4 — (God) will wipe every tear from their eyes. There will be no more death’ or mourning or crying or pain, for the old order of things has passed away. Now hear me while I pray, Take all my guilt away; O let me from this day be wholly Thine! The years before, during, and after the Civil War in this country were not only years of great conflict, but also of great spiritual revival, both in the North and the South. Philadelphia Pastor Dudley Tyng was deeply involved in both the conflict and the revival. He served as his father’s assistant at the Episcopal Church of the Epiphany in the early 1850’s, and then in 1854, when his father retired, he was called to be the church’s senior pastor. It seemed like a great fit, but before long the trouble started. Pastor Tyng was an abolitionist, and preached vigorously against slavery. This was the North where there were no slaves, but many in his congregation were ready to allow slavery to exist and even expand in the rest of the country, rather than risk conflict– and they did not want to hear about it from the pulpit. There were loud complaints against Tyng, and in 1856, after just two years as senior pastor, he was forced to resign. He was forced out because his faith in Jesus had inspired him to take a stand against slavery. Tyng went out and started his own church elsewhere in the city, the Church of the Covenant. There he preached freely and powerfully, and his reputation grew. In that time of spiritual revival Pastor Tyng promoted large meetings for young men and fathers, similar to the “Promise Keeper Rallies” of a few years ago. A week later, while studying in his home office, Pastor Tyng took a break. He walked over to a nearby farm. Out in the barnyard was a mule walking round and round, hitched up to a wheel that ran a machine that shelled corn. Tyng reached out to pat the mule, and his sleeve got caught in the wheel cogs. His arm was ripped from its socket and a main artery was severed. Four days later, the arm was amputated in hopes of saving his life. But the injury was too severe, and it became clear that he would not live. This hymn that has inspired the faith and service of so many, was written in memory of a man who was always ready to stand up for what he believed, and yet, the hymn is filled with words of dependence not on self but on God. A few of the words in verse two are especially interesting. No doubt with Tyng in mind, Duffield wrote, “Stand up, stand up for Jesus, stand in His strength alone;” and then, “The arm of flesh will fail you, you dare not trust your own.” The ‘arm of flesh will fail you’ image was more than a symbol in the life and death of Dudley Tyng. Duffield probably also had in friend in mind when he wrote the last verse, “Stand up, stand up for Jesus, the strife will not be long.” For Tyng, the strife of this life was ended when he was only 33 years old. Ephesians 6:13-15 — Therefore put on the full armor of God, so that when the day of evil comes, you may be able to stand your ground, and after you have done everything, to stand. Stand firm then, with the belt of truth buckled around your waist, with the breastplate of righteousness in place, and with your feet fitted with the readiness that comes from the gospel of peace. 1 Corinthians 15:18 — Therefore, my dear brothers and sisters, stand firm. Let nothing move you. Always give yourselves fully to the work of the Lord, because you know that your labor in the Lord is not in vain. 2 Thessalonians 2:15 — So then, brothers and sisters, stand firm and hold fast to the teachings we passed on to you, whether by word of mouth or by letter. James 5:8 — You too, be patient and stand firm, because the Lord’s coming is near. 510) Can It Get Any Worse? Whenever I am asked that, I think about Martin Rinkhart, the writer of the hymn Now Thank We All Our God. Martin Rinkhart was a Lutheran pastor in Eilenburg, Germany from 1617 to 1649. During thirty of those thirty-two years the Thirty Years War was raging all over central Europe, with Germany receiving the worst of it. This war has been called one of the most brutal and devastating wars in all history. Before the war, Germany had a population of 16 million. After the war, the population was 6 million. Ten million of 16 million Germans died in those 30 years. If they did not die as soldiers in battle, they were as civilians hacked to death by invading armies, or, they died in famines caused by war’s the ongoing disruption of farming, or, they died by the disease that spread among fleeing refugees crowded into the towns. Eilenburg, where Martin Rinkhart was the pastor, was a small city, but it had a wall around it, so many people fled there for safety from the armies. Too many people and very little food led to ongoing hunger and starvation. People would be seen in the streets fighting over a dead cat or crow. Overcrowding led to disease, and then to plagues. A high percentage of people died, only to be replaced by more refugees streaming in; and then many of them died. One of the town’s pastors fled, two other pastors died, so Rinkhart was the only pastor left in Eilenburg. At times, he was doing 50-60 funerals a day– 5,000 in all before the war ended, including that of his own wife. Twice, he saved the city from even worse destruction by risking his life to go out and negotiate with the threatening army outside the city walls. Finally the war ended, and one year later an exhausted Martin Rinkhart died at the age of 63. In the midst of that war, around 1636, Martin Rinkhart wrote what has been called the greatest hymn of thanksgiving ever written. It must have seemed like the end of the world was at hand, but Rinkhart still wanted to teach his children to express their gratitude to God for his blessings. He wrote a poem for them to learn and recite together, and years later the poem was put to music. “Now thank we all our God,” he wrote in the midst of unspeakable misery, “with hearts and hands and voices; who wondrous things has done, in whom this world rejoices; who from our mother’s arms, has blessed us on our way, with countless gifts of love, and still is ours today.” And then, “O may this bounteous God, through all our life be near us; and keep us in his grace, and guide us when perplexed; and free us from all ills, in this world and the next.” Only with his eye on the eternal promises of God could he have written such lines in the midst of the suffering and danger that went on and on for thirty long years. It is a realistic hymn. It speaks of the ills, and, of being perplexed by it all; but still, the unmistakable, dominant theme is that of thanks and praise and abiding trust. There have been few times and places that have endured such intense misery for such a long period of time as Eilenburg, Germany during the Thirty Years War. Yet, it was out of this misery that this great hymn was written. Yes, the Lord might return and and the world might end today; but it won’t be because we are in the worst of times. I am glad I am living in the United States in the 21st century instead of German in the 17th century. Certainly, we today, in comfort and amidst so many blessings, should also find plenty of reason to thank our God with our whole heart. Habakkuk 3:16-18 — I heard and my heart pounded, my lips quivered at the sound; decay crept into my bones, and my legs trembled. Yet I will wait patiently for the day of calamity to come on the nation invading us. Though the fig tree does not bud and there are no grapes on the vines, though the olive crop fails and the fields produce no food, though there are no sheep in the pen and no cattle in the stalls, yet I will rejoice in the Lord, I will be joyful in God my Savior. Anna Warner was born in 1827 to a wealthy New York lawyer and his wife. Her mother died from complications during her birth. Anna and her sister Susan were raised by their father, who did well until he suffered severe financial losses in the Panic of 1837. Other difficulties left the family reduced to desperation and faced with eviction from their home. As teenagers the girls began writing to earn a little money to help out with the family debts and expenses. By the late 1850’s the two sisters were writing novels that were very popular in the last half of the 19th century. Then, the novels were forgotten and for many years have been out of print and unread— except for a few stanzas of a poem in one of the books. In 1860 Susan published a novel entitled Say and Seal which became, like many of their books, a best seller. That book contained a poem, written by Anna, which is now familiar to Christians around the world. With this Mr. Linden sought to comfort the final moments of the dying boy. A few hours later, little Johnny Fax went to be with the Lord, the One who loved him so much. The child-like faith expressed in those words were inspired by Anna’s own profound faith in God. She, like Mr. Linden, also taught Sunday School for many years. Her uncle, Rev. Thomas Warner, was a chaplain at the West Point Army Academy, just across the river from their long-time home on Constitution Island. For many years Anna and Susan taught a Sunday class for the cadets at the Academy, and their long years of service were greatly appreciated. After their deaths they were honored by being buried in the West Point Military cemetery. They are the only two civilians in the entire cemetery. Many stories that have grown up around this song. One is that someone asked Karl Barth, the great theologian, to summarize the essence of the Christian faith in a few words. He responded, “Jesus loves me, this I know, for the Bible tells me so.” Another is that, at the height of persecution in Communist China, a Christian sent a message to a friend. The message escaped the attention of the censors because it said simply: “The this I know people are well.” That phrase, the “this I know people” clearly identified the Christian community in China. It assured the friend that the church in China was alive and well. In 1944, John Hersey wrote an article for The New Yorker entitled “Survival.” This was the story, told to him by John F. Kennedy, of the rescue of Kennedy and his crew after their PT-109 boat was destroyed in the Solomon Islands. After being stranded several days on an island, Kennedy and his men were discovered by two natives. Through the efforts of these natives who led a rescue boat to the island, the men were saved. Hersey concludes his dramatic account with this anecdote: “Johnston (one of the rescued men) retired topside and sat with his arms around a couple of roly poly, mission-trained natives. And in the fresh breeze on the way home they sang together a hymn all three happened to know: Jesus Loves Me. To Hersey’s readers, in the midst of World War II, these well-known words with their simple expression of faith had a special meaning. This familiar hymn, carried all over the world by nineteenth century missionaries, has long been a part of the Christian education of many children. The simple words and lilting tune are easily learned and thus make it a great favorite in Sunday school classes for young children. No doubt, it was this same simplicity that made it so popular with the missionaries for, apparently, once learned, it is never forgotten. Therefore, it is not so surprising that it should pop up as a common bond between the American sailors and the Solomon Island natives. Ephesians 3:17b-18 — I pray that you, being rooted and established in love, may have power, together with all the Lord’s holy people, to grasp how wide and long and high and deep is the love of Christ. Romans 8:38-39 — I am convinced that neither death nor life, neither angels nor demons, neither the present nor the future, nor any powers, neither height nor depth, nor anything else in all creation, will be able to separate us from the love of God that is in Christ Jesus our Lord. Many congregations sing this at every service. It has been said that this one verse has done more to teach the doctrine of the Trinity than all the theology books ever written. The four lines usually stand alone, but they were originally written as the last verse of two longer hymns. Martin Luther (1483-1546) was the first person in many centuries to write hymns for the congregation to sing at worship. Previous to that, the congregation would sing only Psalms from the Bible, rephrased and put to music. Luther argued that the devil should not be allowed to have all the good music, so in about 1525 he began writing popular hymns for congregational singing. A little more than a hundred years later, Thomas Ken was born in a suburb of London. Hymn singing had not yet caught on in England– in fact, it was illegal. But Thomas Ken was not one to let the law get in the way of his convictions, so he wrote hymns anyway. He was, for a time, the chaplain at a boys school, and he wrote two hymns for the boys’ devotions: one for them to sing for their morning devotions, Awake, My Soul, and With the Sun for them to sing for their morning devotions, and, All Praise to Thee, My God, This Night for evening devotions. The Doxology was the last verse of each of these hymns. In order to avoid trouble, Ken told the boys to sing the hymns only in the privacy of their rooms. Years later when hymn singing became legal, these morning and evening hymns became among the most popular in all England, and the Doxology, one of the most widely used verses of all time. Ken was a gifted preacher and rose through the ranks of church authority quickly. He became a bishop as a young man, and even served in the palace of the king on various occasions. But Bishop Ken’s plain-spoken condemnation of sin got him into trouble over and over again. He would often denounce the corrupt lives of those in authority, including the king for his many mistresses. Some of the rulers appreciated such boldness in a preacher, and some did not. So over the years Thomas Ken went back and forth, one year serving as chaplain to the king’s court, the highest position in the land for a clergyman; and the next year being imprisoned in the Tower of London for his convictions. Knowing that Jesus was his real King, Ken would not go against the command of Jesus to bow to any earthly king. He was offered earthly comfort, fame, and authority; but when speaking the truth meant forsaking all of that, he spoke the truth. Psalm 67:8 — Praise our God, all peoples, let the sound of his praise be heard. Psalm 43:5 — Why, my soul, are you downcast? Why so disturbed within me? Put your hope in God, for I will yet praise him, my Savior and my God. George Matheson was born in Glasgow, Scotland, on March 27, 1842. He had only partial vision as a boy. After he entered Glasgow University, his sight failed rapidly and he became totally blind at the age of eighteen. Despite this handicap he was a brilliant scholar and finished the University and the Seminary of the Church of Scotland with high honors. In 1886 he became pastor of the 2,000 member St. Bernard’s Parish Church in Edinburgh. He went on to become known as one of Scotland’s outstanding preachers and pastors, greatly esteemed in Edinburgh, where his eloquent preaching consistently attracted large crowds. Matheson never married, but throughout his fruitful ministry he was aided by a devoted sister, who herself learned Greek, Latin, and Hebrew in order to aid him in his theological studies. She was his faithful co-worker and helper throughout his life, assisting in his calling and other pastoral duties. Matheson died in 1906. Psalm 44:25-6 — We are brought down to the dust; our bodies cling to the ground. Rise up and help us; redeem us because of your unfailing love. Psalm 52:8b — …I trust in God’s unfailing love for ever and ever.